Dave Splash Dot Com: My First Post on "The Event"
My First Post on "The Event"
I was going to wait a few weeks before deciding whether or not I was going to post anything about NBC's new science fiction thriller, The Event. I guess the time is right, because here we are with my first post on the show. The show's title is intentionally vague, and it almost prevented me from watching it at all. The Event? That could describe pretty much anything, and I don't watch just anything. You know? I have described the show to friends as a "science fiction 24," and I think that is pretty accurate. The pilot episode was extremely confusing, as it kept jumping back and forth to different times to give the viewer a little background on the characters who were already knee-deep in whatever "event" was happening. We first meet Sean Walker, a computer programmer, and his girlfriend, Leila Buchanan, on a cruise the two are taking. They are spending time with some new friends they met on the cruise, Vicky and Greg. 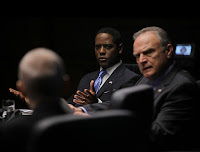 Sean Walker and "Vicky Roberts"
At the same time that we are meeting them, we are also introduced to the President of the United States, Elias Martinez (played by Blair Underwood), and his Vice President, Raymond Jarvis. Martinez was recently elected, and in a briefing with his national security advisers, he is informed about a long running, top secret project being handled in a remote stretch of Alaska (which part of Alaska isn't remote, right?). The project, at Mount Inostranka, is a detention facility where detainees have been held since 1946. The President is told that this detention facility is so secret that most people in the intelligence community are not even aware of it, and information on the facility is on a "need to know" basis. When the President asserts his "need to know," he is shocked by what he hears. In 1946, a ship of unknown origin crashed in Alaska. The "people" on the ship were not human, despite looking indistinguishable from them. Their DNA is only different by 1%, yet that is actually quite a bit when dealing with DNA (and they don't age). These aliens have been held in secret for over 60 years with no hope of release. But President Martinez decides after meeting their leader, Sophia, that it is time for them to be set free. The intelligence community is strongly opposed. Back on the cruise ship, Vicky and Greg separate Sean from Leila. Leila is kidnapped by Greg, who is then killed in order to frame Sean for the murder. That incident was shown as a flashback, as we see Sean on an airplane with a gun, attempting to get inside the cockpit to talk to the pilot. The pilot of the plane is Leila's father, Michael. Unbeknownst to the passengers, Michael is taking the plane off course. He is planning on crashing the airplane into a building where the President is speaking. While Sean is desperately trying to talk to Michael, he is ignoring the requests and staying on course. We learn later that the entire Buchanan family had been either killed or kidnapped, and in order for them to be released, Michael must participate in this attack. Just as the plane is about to crash into the President and his entourage, it miraculously disappears into thin air. It reappears thousands of miles away. All of the passengers, except Sean, appear dead. Sean escapes only to find that he has been framed for the murder of Greg, and no one believes that his girlfriend has been kidnapped. The President realizes that the detainees are somehow responsible for the airplane incident, and decides against releasing them. Through a flashback to 1946, we learn that not all of the aliens were captured. A few escaped. They have been living among us since then, and plotting to get the rest of their people freed so they can leave. Miraculously, the hundreds of passengers who appeared dead suddenly came back to life, and one of those free aliens takes responsibility for the entire thing. He demands the release of the detainees or he will kill the passengers. The alien, Thomas, obviously has abilities beyond those of humans. When the president refuses his demands, he shows those abilities again by harming the passengers as they sat in their hospital beds. A rattled president decides on an alternate scenario. He promises any detainee their freedom if they provide intel on Thomas and the real reason why they came here in the first place. Only one alien takes him up on it, yet he is killed before he is able to reveal anything. Martinez then makes a deal with Thomas for the release of Sophia only, in exchange for the safety of the passengers. The plan is a trap, of course, but what the president and his people don't know is that there are aliens who have infiltrated the government. The plan fails and Sophia and Thomas escape. Meanwhile, there has still been little explanation as to how the Buchanans fit into all of this, and why Sean had to be framed for murder. As Sean tries to search for Leila and determine who Vicky and Greg really are, he is hampered by the FBI who are trying to apprehend him for the murder of Greg. Through a series of events, Sean convinces one of the FBI agents that he is telling the truth, and they begin to search for Vicky and Leila. At about the same time, Leila breaks free from her captor and finds a local Sheriff's office. Though her story seems far-fetched, the cops allow her to make a phone call to her boyfriend. Sean and the FBI agent are closing in on Vicky, and have learned her real identity. They also learned that she has a son. As Leila tries over and over to reach Sean, her calls are going straight to nowhere as his battery is dead. We also discover that Leila's escape was a rouse to get her to contact Sean. Once he gets a chance to charge his battery, Sean hears the messages from Leila and wants to go get her at the Texas Sherriff's Office where she is located. The entire thing is a trap set up by Vicky and her new accomplice, Carter. To make a long story short, Sean and the FBI agent realize it's a trap and use Vicky's son as leverage to get her to help them retrieve Leila and escape unharmed. It works and they escape. The larger question of why Vicky, Greg, and Carter wanted Sean, and what their connection to the aliens is, is still unanswered. We also don't really know specifically why Michael Buchanan was selected as the pilot to crash into the president, nor whether the plan was really to kill the President or to simply display the power of the detainees. There has also been some strong intimation that the Director of National Intelligence, Blake Sterling, and possibly the Vice President, were behind the assassination attempt due to their dislike and distrust of the new president. At the end of the most recent episode, Loyalty, presidential adviser and secret alien, Simon, has his cover blown during his effort to ensure Sophia's escape. At the same time, Sean breaks the bad news about Leila's family to her (Mom dead, sister still kidnapped). Against Sean's better judgment, Leila wants to go to her father's house to see if she can find any clues as to why he would have been involved in this whole thing, in the first place. They find articles about the Alaska crash, and blueprints for the detention facility. While there, Sean and Leila are met by a woman with a gun who warns them to stay away. After overpowering her, they learn that the woman is a journalist who was contacted by Michael after he saw some strange activity while flying over Alaska. If you're confused by all of this, that is normal. It's a confusing show. But as it progresses, it is becoming less so. The real plot is finally beginning to emerge, and we are now beginning to see what is really going on. The real-time action events give the show a 24-like feel, but with the addition of the sci-fi angle, The Event is a pretty unique show. I've always kind of liked Blair Underwood, so seeing him again is cool. But, for me, the breakout hottie star is Taylor Cole, who plays Vicky. Wow. She is smokin'. Taylor Cole as "Vicky Roberts"
I recommend going to Hulu and watching the first few episodes of The Event before next Monday's new one. I am still undecided and have the last episode recorded and unwatched at this point. I guess I will watch it, but it is rather frustrating and at time confusing in its production. After the pilot, I almost stopped watching. It was so all over the place. I see, now, how much of what happened in that first episode is important, but still. I was told the show was supposed to be like Lost, but I don't see it. I am interested in seeing how this season plays out. I really don't care what happens on the show as long as Taylor Cole is featured...damn, she is really nice to look at.